We don’t need to feel alone, afraid, or angry. Lately, the problems in this country and in the world seem so complicated. There is too much decisiveness, debate, blame and mistrust. The arguments online and on TV are affecting us. There IS a simple solution. But, we each need to do our part. We need to Choose Kindness. We need to put our phones away in public and connect with other people – all people. We’ve forgotten how to truly communicate with strangers. People walk through stores, stand in a check out lanes, and complete a transactions without pausing a phone conversation. Meanwhile, opportunities to make eye contact, smile and connect are lost. We’ve become isolated despite our ever growing number of social media friends and followers. That isolation leads to labeling, classifying, assuming, and even discrimination and hatred. We’re all people. We’re here for a short time together. We can choose to get along. It starts with looking up, making eye contact, smiling and acknowledging the humanity in every person we encounter. Start there. 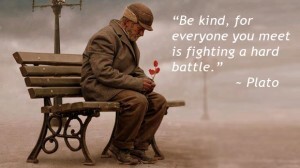 Choose to be kind even when others have not been kind to you. Accept differences. Be tolerant. Avoid unnecessary conflict. Reach out. Offer help. Be supportive. Seek out the positive. Find empathy. Open doors for others. Thank people who open doors. Give compliments. Listen to everyone. Tolerate imperfections. Accept that people make mistakes. Give them the benefit of the doubt. Forgive. Be slow to criticize and complain. If someone is slow to move when the light turns green, don’t honk wildly. If someone honks at you, don’t honk back or give an angry hand gesture. Let it go. If the service is bad, be understanding. Maybe that person is having a bad day. Kindly be encouraging. If your service is needed, do the best you can. Do for others without consideration of pay or reward. Speak positively. Don’t inflate arguments. Chose your battles. You don’t always have to be right. Words can hurt. A mindless social media post can ruin someone’s day, create division and spread anger. Avoid it. Thank people — as many people as you can for everything they do. Acknowledge that you see them, appreciate them, and care about them as people. Be respectful. Pick up litter and leave places nicer than you found them. 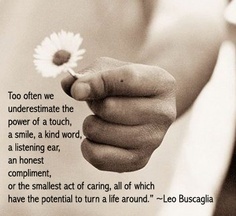 Go out of your way to do something nice for someone. Send a card, pick a flower, buy a cup of coffee, pay a toll or fare, simply to start chains of kindness. Offer help. Give a mom or dad a break. Take care of the elderly by simply spending time with them and listening. Cherish the joy of children and allow them to be free-spirited. Be a good neighbor. Start by getting to know your neighbors. Instead of feuding over things that really don’t matter, build trust and friendships.Fix things rather than complain about what’s wrong. Stop waiting for someone else to change everything. Pick what you are most passionate about, and start there. Offer solutions, find others who can help, and do something.Not everyone is able to make big changes, but, together we can change big things that effect everyone. We can create a kinder world. Need ideas? 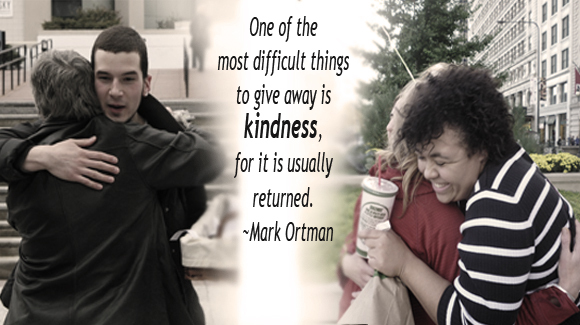 Check out our list of 100 Daily Acts of Kindness. Have ideas about making the world more kind? Share them by commenting below! Join Us for A Spring Kindness Project! Let’s Show Some Seniors Some Love!